Lately I've spiced up my running routine : at least once a week, I run without my Garmin. No time, no speed, no heartbeat. No numbers. I. Just. Run. And I run free. The first 10 minutes, I focus my thoughts on my body. My breath. Inhaling, Exhaling. The brisk air making its way into my lungs. Vapour coming out. How my legs feel. My strides. How my body is poised. My ponytail swaying side to side. Side to side. Side to side. (ok that annoys me a lot). Once I've set up the right pace and the right stride, I let my thoughts wander. Oh dear, do I think. When my thoughts get too loud or I feel like I will end up more stressed than when I started running, I focus on the scenery and usually end the run feeling grateful for being able to run on this earth. When I run like this, I feel like I can change the world (fellow runners, tell me you feel that way too). I feel so strong everything becomes possible. Except I eventually have to stop running and when I do so, I need comfort and energy, especially when it gets cold. 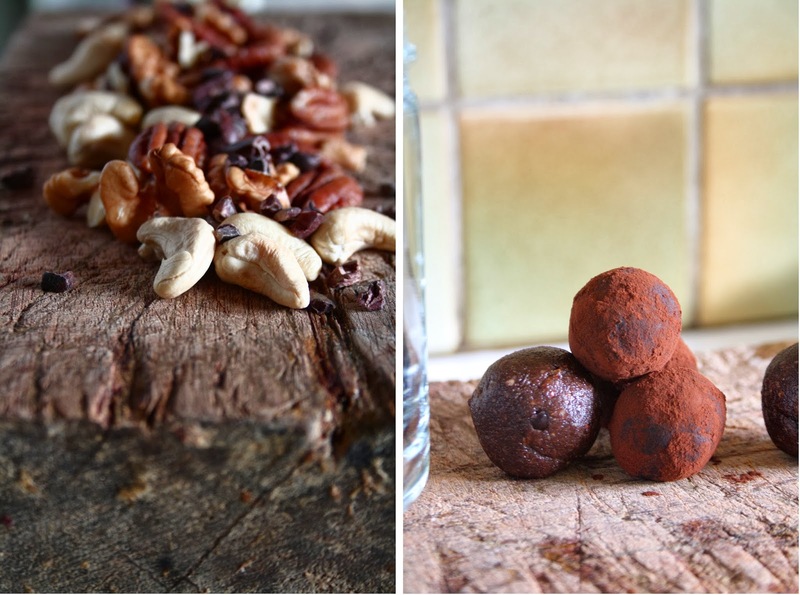 These truffles are the perfect post-run snack. Chocolate for comfort, spices for warmth and nuts for energy! I still love my Garmin. It helps me get better, it prevents me from getting lost when I go trail running and it also helps me set limits. It's the perfect accessory to keep me motivated. I haven't given measurements for the spices because I did not measure. Just adjust to your taste : I usually use more cinnamon and cardamom because that's what I like best. Process the nuts into a flour. Add in the dates and raw cacao. Pulse until it forms a dough. Transfer into a bowl. Fold in the cacao nibs and the spices. Mix well. Form little balls and roll them (but first dry your hands) in cacao if you want or in more cacao nibs. Keep in fridge for up to 6 days or freeze (they can be eaten straight from the freezer). Dans votre robot, réduire en poudre les différentes noix. Ajouter les dattes et le cacao. Mixer jusqu'à former une pâte. Transférer dans un bol puis ajouter les éclats de cacao et les épices. Bien malaxer. Former des petites boules avec les mains humides. Les rouler (avec les mains sèches) dans du cacao en poudre (ou dans des éclats de cacao). Se conservent au frais pendant 6 jours mais elle peuvent être congelées. Hélas, je ne cours pas, j'habite en plein Paris... Mais quand je nage, je ressens la même chose. En général, je me vide la tête, je ne laisse entrer aucune pensée, positive ou négative... Et qu'est-ce que ça repose ! Bien vu pour les spices, j'adore... l'anis, ça change tout ! Je pense pas souvent en à mettre de l'anis... Je me suis inspirée du pain d'épices de ma maman, qui est délicieux (mais ni vegan ni sans gluten)! i'm not a runner anymore, but i can totally relate to your post. i loved that alone time with my thoughts. i always felt so great afterwards, that high, and also the feeling like i had just seen a therapist. running is therapy, i tell you! i love these little cacao truffles. they're perfect for running, or anytime you want a healthy little treat. all those spices sound so warm and comforting. These truffles are super beautiful, love that rich dark color! J'utilise la maca comme épices ici donc tu peux l'omettre ou la remplacer par une autre épice (muscade par exemple) ou du lucuma! Organic raw maca powder is natural and high nutrition food with great taste. It is a fat free food. It is a great source of vitamin C. In addition to this it has many health benefits.